Nearly 5,000 black Americans were lynched between 1890 and 1960. Over forty years later, Sherrilyn Ifill’s On the Courthouse Lawn examines the numerous ways that this racial trauma still resounds across the United States. While the lynchings and their immediate aftermath were devastating, the little-known contemporary consequences, such as the marginalization of political and economic development for black Americans, are equally pernicious. 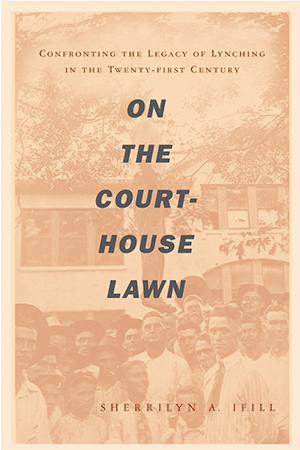 On the Courthouse Lawn investigates how the lynchings implicated average white citizens, some of whom actively participated in the violence while many others witnessed the lynchings but did nothing to stop them. Ifill observes that this history of complicity has become embedded in the social and cultural fabric of local communities, who either supported, condoned, or ignored the violence. She traces the lingering effects of two lynchings in Maryland to illustrate how ubiquitous this history is and issues a clarion call for American communities with histories of racial violence to be proactive in facing this legacy today. Inspired by South Africa’s Truth and Reconciliation Commission, as well as by techniques of restorative justice, Ifill provides concrete ideas to help communities heal, including placing gravestones on the unmarked burial sites of lynching victims, issuing public apologies, establishing mandatory school programs on the local history of lynching, financially compensating those whose family homes or businesses were destroyed in the aftermath of lynching, and creating commemorative public spaces. Because the contemporary effects of racial violence are experienced most intensely in local communities, Ifill argues that reconciliation and reparation efforts must also be locally based in order to bring both black and white Americans together in an efficacious dialogue. A landmark book, On the Courthouse Lawn is a much-needed and urgent road map for communities finally confronting lynching’s long shadow by embracing pragmatic reconciliation and reparation efforts.